Sometimes superhero comics feel like a prison, a place where promising creators are forced to restrain their individual voices to serve larger corporate interests. Black Bolt blasts through those prison walls. A superhero prison drama starring a lead character who can level cities with a single word, Black Bolt tackles big ideas like the morality of incarceration while telling the story of a king coping with the loss of both his authority and freedom. Trapped in an alien prison, Black Bolt has lost his power down to a genetic level, and the setting has neutralized his destructive voice, allowing him to speak without obliterating everything and everyone around him. As someone who is almost always silent, Black Bolt doesn’t become much better at communicating, and his former stature has kept him at a distance from his fellow inmates. Novelist and poet Saladin Ahmed, artist Christian Ward, and letterer Clayton Cowles are working with a character attached to an upcoming Marvel Studios TV/movie endeavor, but they have enough creative leeway to offer their own distinct take on the former Inhuman king. Ahmed has come up with a concept that forces the character into a completely new status quo, and has rapidly established an engaging supporting cast that includes Crusher “The Absorbing Man” Creel, Raava the Skrull warrior, and a psychic girl called Blinky because she has eyes all over her head. Black Bolt is sullen and steadfast, holding on to a royal sense of responsibility despite the loss of his title. He’s dismayed by his current situation, and laments that he was going to send his own brother to this hell. Black Bolt is developing empathy during his imprisonment, and interacting with other prisoners is helping him gain a deeper understanding of how someone’s specific circumstances influence their behavior. The jump from novels to comics can be a challenge for some writers, but Ahmed has made a remarkable debut with this series, largely by embracing the possibilities of the comic-book form and writing scripts that highlight his collaborator’s immense skill. Black Bolt is moving quickly and getting deeper as it progresses, and Ward’s endlessly innovative artwork guarantees multiple visual surprises in each issue. Ward is consistently experimenting with his layouts, design, and coloring, and there’s always a sense of creative excitement in his work. This is his first ongoing superhero title, and it’s difficult to imagine this series being as compelling without his artwork, which evokes the series’ concepts of confinement and escape in its use of the space inside and outside of the panels. These are ideas Ahmed and Ward explore from the very first page of Black Bolt #3. The main image is a full-page shot of Crusher Creel walking through the hole in Black Bolt’s cell, and this step toward escape is paired with a visual break from traditional superhero layouts and compositions. There are two smaller panels overlaid on the larger one, but there’s also a small detail that dramatically changes the geometry of this page. A few pieces of debris floating in the foreground of the big image drift in front of the other panels to place them in a three-dimensional space. The space outside of the black panel borders is the physical environment that these characters are stepping into, and it’s an ingenious way of reflecting the theme of escape in the visuals. The first half of the issue uses rectangular panels, and even with the clever use of the space behind and around panels, there’s still an element of containment. Circles begin to play a much larger role in the layouts once the group regains its superpowers, and the action expands outward in layers of rounded panels. The panel borders bend outward as the breakout continues, threatening then eventually shattering those black lines once the prisoners are free. The circular layout also works especially well for action, particularly the moment when Black Bolt delivers an explosive punch. The curve of the panels combined with the magnification of his fist brings strong velocity to the motion, with coloring that transitions from icy blue to a burning red upon impact. The coloring is driven by the contrast of warm and cold colors, with pops of neon that heighten the fantastic elements of the story. He takes full advantage of the texture and manipulation effects possible with digital coloring, but he doesn’t sacrifice clarity when he’s using these visual tricks. The panel itself is a physical object that Ward manipulates in three dimensions. Black Bolt turning a corner is depicted with a sequence of panels arranged on two angles, creating a cube-shaped layout that the hero moves through. When one of the inmates uses the full extent of his metal-manipulating powers, the panel itself is cleaved in half and bent at the edges, with shards flying past the panel borders toward the reader. A display of Black Bolt’s Inhuman power sends an opponent through the back of a panel, which is placed on an angle to amplify the destructive action. Clayton Cowles is highlighting the storytelling value of lettering with his work on books like Black Bolt and The Unbelievable Gwenpool (read more about that in this Comics Panel review of the last issue). Going back to that treasure chest of the first page, the opening narration box reveals how Cowles’ lettering enhances the poetic quality of Ahmed’s writing. Having three consecutive lines start with “A” unites those phrases, and directly underneath Black Bolt’s name are three descriptors that provide a concise, accurate summary of the character: “monarch,” “weapon,” “prisoner.” Cowles uses different word balloon shapes, colors, and fonts to indicate the specific vocal qualities of characters from various alien species, and the spacing of his word balloons guides the eye through the layouts while also heightening tension in various moments, like when Black Bolt discovers the horrifying secret of what’s at the prison’s core. Marvel Studios released the trailer for the new Inhumans TV miniseries last month, and the most disappointing thing about it is the total lack of imagination in the production design. The costumes and makeup (including Medusa’s awful wig) are dull and cheap-looking, and the aggressively gray setting of the Inhumans’ home on the moon does nothing to inspire awe or wonder. It makes the ingenuity and boldness of Black Bolt all the more impressive, and strange characters like the Inhumans deserve a more interesting, ambitious design sensibility than what the TV show footage has revealed thus far. The first two episodes of Inhumans are being screened on IMAX screens, but the trailer gives no indication that this is something that should be watched on a big screen for premium ticket prices. It’s hard to be optimistic about the Inhumans show, but the comics are in an upswing. Marvel has struggled to get its Inhumans line of comics to take off in recent years, but the publisher is making smarter decisions in the lead-up to the release of the TV miniseries. Al Ewing’s Royals takes the Inhuman royal family into space for a rollicking cosmic adventure, and while the book has suffered from visual inconsistency, artist Javier Rodriguez is joining the book with issue #9. Rodriguez has been doing some of the most breathtaking, inventive artwork in superhero comics with Doctor Strange And The Sorcerers Supreme, and he’s going to give Royals a major boost. Next month sees the debut of Inhumans: Once And Future Kings, a new miniseries that has writer Christopher Priest and artist Phil Noto updating the origin of these characters. Given Priest’s success in turning Slade Wilson into a compelling, complex lead in DC’s Deathstroke, he could be the writer to build a strong emotional foundation for Black Bolt, Maximus, and Medusa. I’ve read the first issue of Once And Future Kings, and Priest and Noto deliver a story that is part Shakespeare and part Game Of Thrones in its depiction of royal intrigue and family drama that has a heightened sense of scale, both in terms of emotion and visuals. 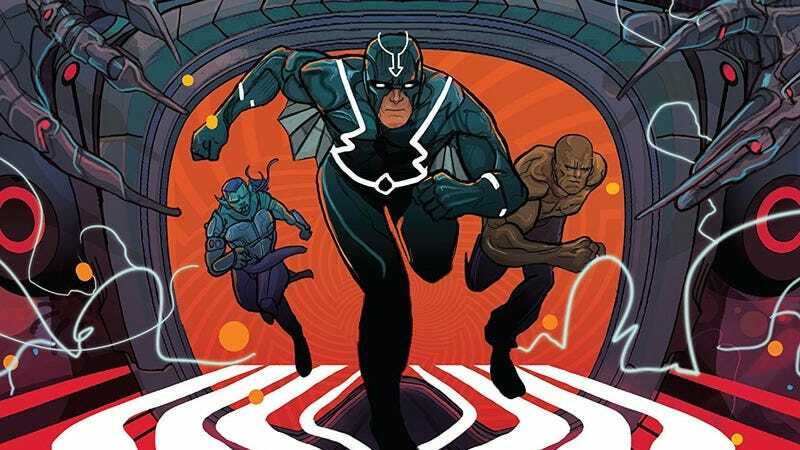 The one-two punch of Black Bolt and Once And Future Kings brings a lot of depth to the Inhuman monarch, and Marvel is finally on the right track to making its Inhumans titles some of the most captivating books in its lineup.